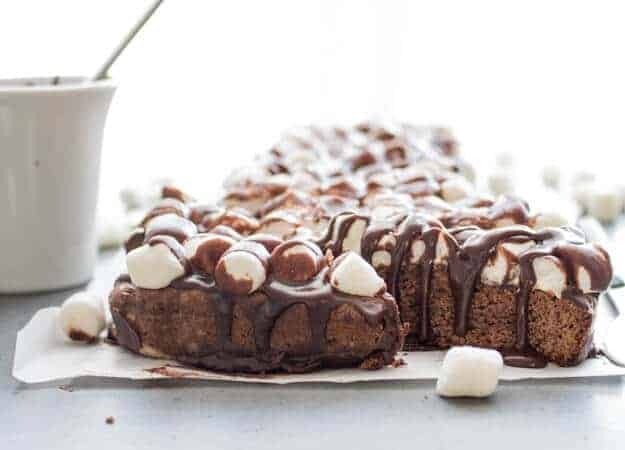 Fudgy Marshmallow Brownie Cake, a delicious Moist Brownie covered in Melting Marshmallows and a decadent Fudge Topping, all this makes this Brownie the Perfect Chocolate Dessert. If you love Chocolate as much as me or almost as much as me, you are going to love this Fudgy Brownie Marshmallow Cake. This Brownie Cake has got to be the original Death by Chocolate! My mother would make this recipe every Christmas, and only Christmas. It is the Ultimate Chocolate Decadent Dessert, really rich and ohhhh so delicious. She would start her baking about 2 or 3 weeks before Christmas and then everything into the freezer. I certainly didn’t let the freezer get between me and these pieces of heaven. Yes I would sneak a couple and while I was reaching for one or two I would grab a couple of Shortbread while I was at it. 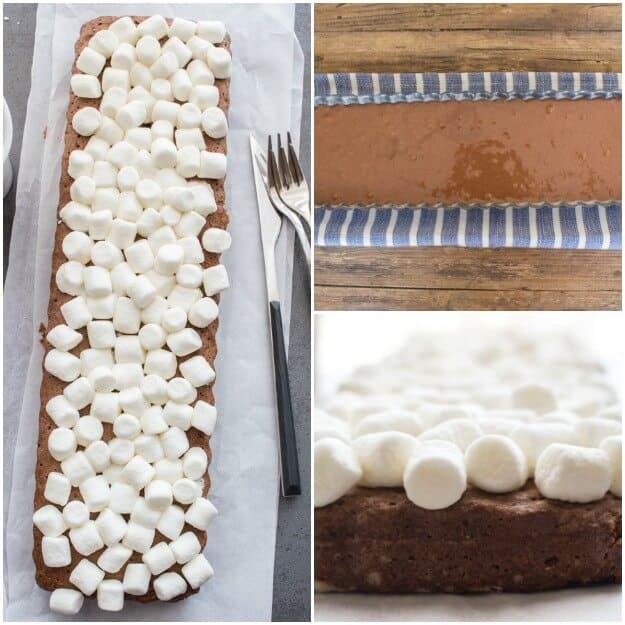 Fudgy Marshmallow Brownie Cake is really easy to make. 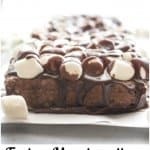 The base is a yummy moist chocolate brownie and as soon as it comes out of the oven, top it up quick with marshmallows cut in half or as I prefer to use mini marshmallows, and then cover with this luscious fudgy sauce. Let it cool and slice it up. This Chocolate Fudge Brownie Cake makes the Perfect Dessert, Christmas or not! Or if you wish you could always serve it like my Mom used to and slice the cake up into small pieces like a Cookie Bar Recipe. This is one Chocolate Brownie Recipe you are going to want to try now and not wait for Christmas! Enjoy! A delicious brownie, topped with marshmallows and a creamy smooth fudge sauce. The perfect decadent dessert. Pre-heat oven to 350° (180° celsius), grease and flour an 8 inch pan (20 centimeters). In a small pan, melt butter, remove from heat and blend in cocoa until smooth, remove to a medium bowl, set aside to cool. Meanwhile, in a small bowl beat eggs, gradually beat in sugar, stir egg mixture into butter/cocoa mixture, add flour and salt and beat until well mixed, stir in vanilla. Place in prepared cake pan and bake approximately 30-45 minutes (check after 30 minutes, use a tooth pick to check for doneness). While brownie is baking prepare Quick Fudge Frosting**. Remove from oven and immediately press halved marshmallows on top of the Brownie, cut side down, pour Quick Fudge Frosting on top of marshmallows and spread to cover completely. Cool and cut into squares. Enjoy! In a medium bowl add sifted 1 1/2 cups powdered sugar and cocoa add salt. In a small pot heat milk and butter (heat just until butter is melted, do not boil),let cool slightly then add to powdered sugar mixture with vanilla. Beat until smooth. (if you like a thicker sauce either add more powdered sugar or less milk). Hi Rosemary, the directions say o use an 8″ pan but what did you use to make the cake long and skinny? Hi Mrs SW thanks, I used a 13.5 x 3.5 inch tart pan, the kind where the bottom is removable and it sits in the frame. Hope that helps. Hi Sheila, oh good, I hope you enjoy it. Have a great weekend. Hi Oana, thanks hope you enjoy it. 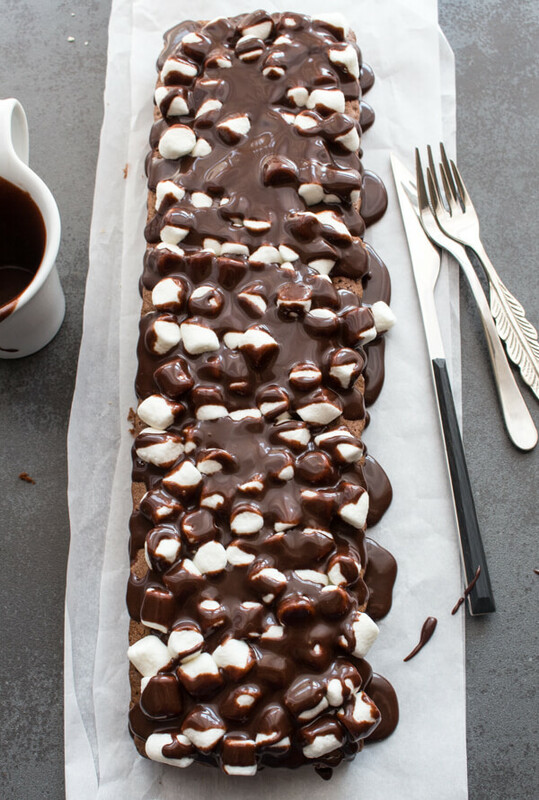 This looks so fudgy and delicious, I love the marshmallows on top! 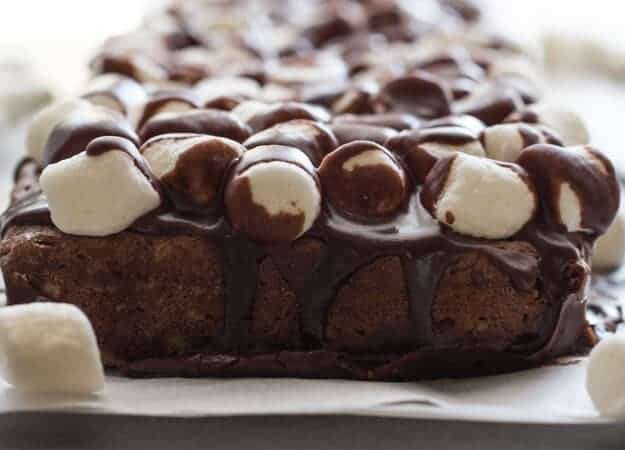 WoW – this is fantastic Marshmallow Brownie Cake , sounds like just the perfect dessert. Hi Molly thanks it is a delicious dessert. This cake looks stunning. I am absolutely drooling. Yum yum. Brownies are the best. They are the bestest when turned into a cake! Hi Whitney, I totally agree. Looks decadent! I’m sure this would be a big hit if I fed it to my family over the holidays! Hi Rachel, thanks, hope you give it a try. I love this, it looks so simple and easy to make yet the results are totally impressive, saving this one for later, thank you for sharing this delicious recipe! Hi Sara, thanks hope you enjoy it. Hi Sara, thanks. Let me know how you like it. Oh yum!! Looks fabulous!! I could use a piece right now!! Thanks Cassandrea, it is delicious. Thanks Byron, I know eh? Have a great day!